Whether glass is half empty or half full does not matter. We are asking the wrong question. Every single drop of water in the glass has the potential to quench the thirst of entire cosmos. Each drop is as powerful as the Ocean itself. Sudama was Krishna’s best friend. He was poor and did not have very many material belongings. One day Sri Krishna visited him unannounced. Sudama did not have anything nice to offer him. All he had was one grain of rice left. Sri Krishna took that grain, put it in his mouth and through that one grain of rice fed all the beings on Earth, the Gods and the entire creation. It was a grain offered with love by a dear friend and a devotee whose heart was as pure as chandan (sandalwood). PLANETARY COMBINATIONS: Everyone is suffering. We look around and all of us can feel intense pressure one way or the other. We may see people smiling around us but you go beneath the surface and will find out that they are all dealing with so many issues. Mars is aspecting Saturn (4th aspect, exact degree). Saturn in turn is aspecting Moon (3rd aspect) as well as Mars (10th aspect). Sun is with Rahu (same degree). Rahu is aspecting Moon (5th aspect) and is aspecting Mars (12th aspect). This seems like a lot of intense energy. But there is absolutely no progress on the spiritual path without involvement of these malefic (harsh) planets. They are like strict teachers in school. We could not stand them while we were in school but once we graduate, strict teachers are usually the ones we remember fondly and are most thankful for. ARE WE THANKFUL? If we can breathe fresh air, If we have eyes to be able to see, If we can walk on this Earth, If we have lips to smile, If we have longing for the Divine in our hearts… Then we have enough. Because all that matters is a single drop of water or a single grain of rice. 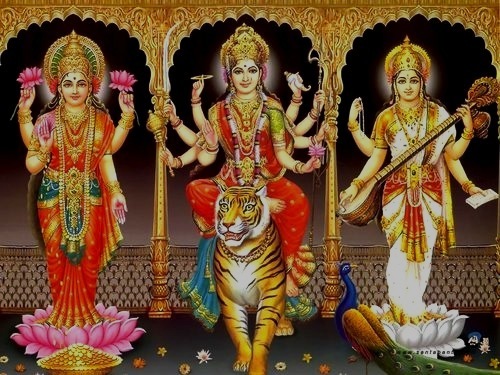 DEVI PHASE: This morning with the equinox, we entered the Devi phase which lasts for 6 months. Devi is Prakriti. Devi is hidden. Devi is gentle and sensitive. Devi resides in our Heart. As we go within during this phase belonging to Shakti, we will find precious jewels within which were not visible earlier due to blinding external sources of artificial light. O Mother, you are the supreme consciousness of the Purusha. Salutations O Devi, the auspiciousness in the auspicious, the prosperity (Lakshmi) of the prosperous. Oh Durga, you enable men to cross the Ocean of the world, You are the life, strength and cause of all. Oh Divine Mother, who dwells in the form of INTELLIGENCE in all living beings. Oh Divine Mother, who exists in the form of SLEEP in all living beings. Salutations again and again. This entry was posted in Rama and Krishna on September 23, 2015 by illuminatelifetoday. Among the Dashavatāras (10 incarnations) of Vishnu, Lord Rama and Lord Krishna are the two most worshiped Gods among Hindu households. It is lord Krishna’s appearance day tonight (8th lunar day of waning phase). Lord Rama is an incarnation of Sun whereas Lord Krishna is an incarnation of Moon. Sun rules the day whereas Moon rules the night sky. Lord Rama was known as Purusha Purushottam (the highest or ideal human being). He was born on the 9th Tithi (lunar day) of the Shukla Paksha (waxing / bright phase of the Moon). 9th House in the chart stands for Dharma. He was an ideal king and his life was full of sacrifices just like the Sun who sacrifices his own life to provide light to others. Lord Krishna on the other hand was born on the 8th Tithi (lunar day) of Krishna paksha (waning / dark phase of the Moon). 8th House in the chart stands for change and transformation. Krishna brought about the most dramatic transformation in human history. Krishna is dark / blue in color, hence he rules the night sky. Moon is our mind. Being an incarnation of Moon, Krishna rules our mind, emotions and bhakti. Om Devaki Nandanaaya Vidmahe, Vasudevaaya Dheemahi, Tannah Krishnah Prachodayaat. This entry was posted in Rama and Krishna on August 16, 2014 by illuminatelifetoday.